2007-2008 Mercedes-Benz GL320 CDI 4MATIC 4-Wheel Air Suspension Conversion Kit With Suspension Warning Light Module (MK14FM) is the perfect solution to your air suspension problems. Designed to be very affordable, you can convert your air suspension to use standard. When one component of the air suspension system on the 07-08 Mercedes GL320 CDI stops working, the rest of the system follows suit. Strutmasters' air to non-air suspension conversion kit gets rid of this expensive dependence for good. The kit, made in America, comes complete with two rear shocks, two rear coil springs, two front coilover struts preloaded with Eibach springs, new mounts, and all necessary hardware. Detailed instructions and online installation videos help customers get the kit installed in about one hour per wheel. Our in-house ASE certified technicians are available to answer questions if further assistance is needed. The kit is vastly less expensive than dealership direct replacement or individual aftermarket part replacement. But it doesn't sacrifice quality- Strutmasters guarantees this with a Lifetime Limited Warranty. 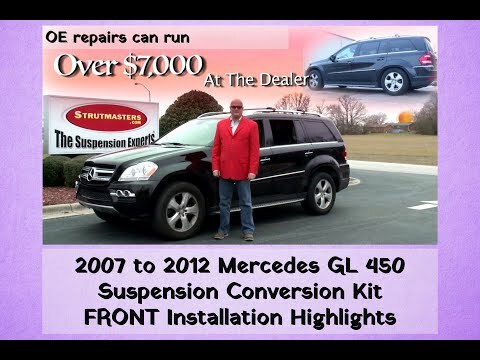 Look for the following signs to determine if the 2007-08 Mercedes-Benz GL320 CDI has a failed or leaking air suspension system. Early identification of a bad suspension is critical to avoiding total failure. Mainly, if the GL320 is unable to reach and maintain its proper ride height, a bad suspension is likely. Look for an obviously sagging end, an overly-inflated end, a ‚Äúsquatting‚Äù appearance, or a shifting lean from side to side. Any of these imbalances will wear out the air compressor. If the air compressor has already stopped working, a suspension warning light will illuminate on the dash. At this point, suspension failure is advanced. Any repair or replacement will be vastly more expensive. To avoid this worst-case scenario, have any suspension issue fixed as soon as it's noticed.